Arrupe Jesuit High School is in its 16th year, with over 130 corporate partners in the Denver metro area. The Corporate Work Study Program (CWSP) is an integral part of an Arrupe Jesuit education. Students fill entry-level office positions in banking, law, medicine, finance and many other exciting career fields. The CWSP experience provides tremendous opportunity for economically disadvantaged students to get a college-prep education, while at the same time giving partner organizations a very economical hiring alternative for entry-level office positions. Partner organizations contract with CWSP to fill full-time, entry level jobs. The fee-for-service contractual period spans approximately ten months from the middle of August to the first week in June. These jobs are paid positions, with the money earned paid directly to Arrupe CWSP to cover nearly 50% of the students’ tuition cost. Students are employees of CWSP. Arrupe CWSP staff members provide customer support in addition to handling all payroll, W-4, I-9, workers’ compensation and other employer issues for the students. CWSP trains the students, provides transportation, and works with hiring organizations to assign motivated, enthusiastic student workers who can best meet your business needs! Each student works one full (8 AM - 4 PM) day a week, five full days a month. The remaining four days of the week the student attends classes. 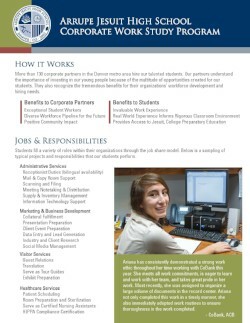 Below is a sampling of the type of jobs and tasks that students perform.